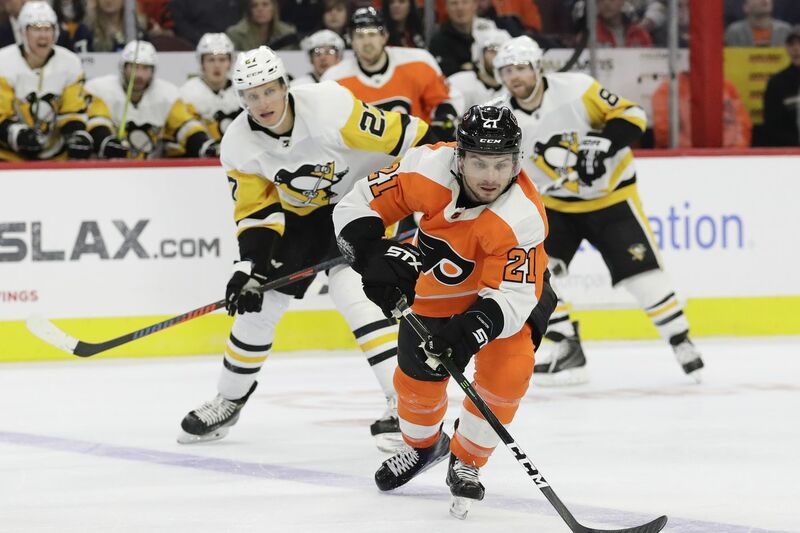 Flyers center Scott Laughton, shown skating past Pittsburgh's Nick Bjugstad last month, has been one of the team's most improved players. WASHINGTON — When the epitaph is written on the Flyers’ bizarre 2018-19 season, injuries to their goalies — and poor performances by their replacements before Carter Hart arrived — will be mentioned prominently. The Flyers have accumulated the fewest home points of any of the eight Metropolitan Division teams. Surprisingly, they have just 18 wins and 20 losses (18-16-4) at the Wells Fargo Center. They need to win all three of their remaining games there (vs. Toronto, the Rangers, and Carolina) or they will finish with just their second losing home record in the last 24 seasons — and only their sixth since the franchise started in 1967-68. The Flyers, who will host Toronto on Wednesday night, were one of the NHL’s best teams for more than a two-month stretch, going 18-4-2 and inching to within three points of a wild-card spot with 13 games remaining. At the time, they seemed to have a decent chance to become the first team in NHL history to reach the playoffs after trailing by 16 points at one point in the season. Since that sizzling run, however, they have gone 2-5, including defeats in their last three home games: losing to Washington, 5-2; falling to Montreal, 3-1; and getting outplayed by the Islanders, 4-2. The Flyers’ offense has sputtered down the stretch, making wins possible only if their goalies were exceptional. Relying on your goaltender to steal wins is not the optimal situation, though Hart has done his part, making 41 and 40 saves, respectively, in each of the Flyers’ last two wins. Put it all together, and you have a team that is eight points out of a playoff spot with six games left. Actually, it’s almost impossible. The Athletic gives them a 0.1 percent chance. That’s one in a thousand. The Flyers’ awful start (15-22-6), their goaltending injuries, and their struggles at home are the main reasons. If the team is going to be a legitimate Stanley Cup contender, it still needs three key pieces: a veteran to stabilize the defense, a No. 2 center, and a high-scoring winger. General manager Chuck Fletcher’s first offseason with the team should be a busy one. Fletcher’s roster needs upgrading. Never was that more evident than in the Flyers’ games against the four division leaders: Tampa Bay, Washington, Winnipeg and Calgary. They have just one win in 10 games (1-6-3) against those powerful teams.